The following are some of the questions that have come up over the years concerning either Kuk Sool Won ™ or martial arts in general, and which are relevant to the practice of Kuk Sool Won ™. Many thanks to Kuk Sool Greater Rochester (USA) for these FAQs. What makes Kuk Sool Won ™ different from Karate? I've heard a little bit about Karate, but Kuk Sool Won ™ is new to me. I already have a Belt in another martial art. Will I be able to keep my same rank when I start classes at Kuk Sool Won ™ Sudbury? My wife wants me to take Kuk Sool Won ™ with my son, but I already have a Brown Belt in Tae Kwon Do. Won't this just be more of the same thing? Would it be possible to take two different styles of martial arts at the same time? When do your classes begin? Do I need to wait until the beginning of the season to start? How often do I need to come to class? I'm not sure if I have enough time to do well and progress in martial arts. Do I need to be able to do gymnastics to take Kuk Sool Won ™? Do you spar in Kuk Sool Won ™? Do you have tournaments? What are they like? Is participation required? I am trying to decide whether to sign my children up for football or for Kuk Sool Won ™. We don't have time for both. How can I decide which will be better for them? When is a good age to start? Also, I would like to have a family activity, but since I am older and my child is 6, will I be held back to her level if we take at the same time? I'm in my 40s and have some old injuries. I am worried that Kuk Sool Won ™ training might be too much for me. I have to be out of town a lot and may be unable to attend all of the classes. Will this hold me back? Will I be charged for classes I don't attend? I would like for my son to take Kuk Sool Won ™ but he's got a bad temper. I'm just worried that he might use this to hurt other kids. Should someone like him take martial arts? My daughter is little and shy. I would like to get her into something to build her self-confidence and physical condition. Is Kuk Sool Won ™ right for her? Will she get hurt? Is everything included in my monthly tuition? Are there other Kuk Sool Won ™ schools around? How do I know that I'm getting quality instruction? I'm always hearing about "ancient" martial arts techniques. How old is Kuk Sool Won ™? But I thought that Tae Kwon Do was the traditional Korean martial art? If Tae Kwon Do and Kuk Sool Won ™ are both Korean, why do they look so different? Is Kuk Sool Won ™ safe? I am a professional and I can't really afford to show up in the office with a black eye or a broken nose! I noticed that during your classes, people spend a lot of time "yelling." What is that all about? I am a woman and I am interested in learning self-defense. What will I learn, and how soon will I learn it? Does Kuk Sool Won ™ offer weapons training? With all of the schools and styles of karate available, why should I decide to take Kuk Sool Won ™? Q. What makes Kuk Sool Won ™ different from Karate? I've heard a little bit about Karate, but Kuk Sool Won ™ is new to me. A. This is probably the most common question we hear - because of the media exposure of karate, people are much more familiar with that term than they are with the more specific name of Kuk Sool Won ™. "Karate" really isn't a style of martial art, but is instead a general term applied to many of the Japanese/Okinawan striking arts and which can refer to a number of different styles of karate that are each different and unique in their own way. For example, Isshin-Ryu Karate is a style of karate that was developed on Okinawa in the 1950's and is known for powerful striking techniques and the use of the vertical fist, while Shotokan Karate is a very hard and linear style that was brought to Japan and formalized in the early 20th century by Ginchin Funakoshi. Funakoshi was an Okinawan educator who moved to Japan and helped to popularized karate by adopting the belt-ranking system of Judo and introducing the style into the Japanese educational system - because of his success, many of the forms of Japanese karate that developed later are more or less derivatives of the Funakoshi system and utilize the same kata (forms) and types of techniques to a greater or lesser degree. PHILOSOPHY: While karate styles tend to be very hard and linear, Kuk Sool Won ™ is distinguished by being a "hard-soft" system with techniques that are very flowing and circular, pleasing to the eye but devastating to an attacker as the Kuk Sool practitioner uses these soft, circular movements to redirect and upset the attacker's balance and equilibrium before applying a counter technique to one of the hundreds of sensitive joints and pressure points they are trained to attack. This "hard-soft" philosophy is embodied in the 3 Principles that guide all Kuk Sool techniques: Yu-Won-Hwa (Soft/Yielding-Circular-Harmony/Blending). Not only does this philosophy of "hard-soft" lend itself to very effective defensive techniques, it also allows the practitioner to develop a more relaxed and refined power and to develop and maintain a high level of health. CURRICULUM: Karate styles (these include all of the Japanese/Okinawan systems, as well as Tae Kwon Do/Tang Soo Do which developed from them) tend to be primarily concerned with striking and kicking, with some emphasis placed on throwing or grappling to a fairly limited degree. Kuk Sool Won ™, in contrast, is a complete martial arts system and includes aspects of all traditional Asian fighting methods in its curriculum: Striking and kicking, throwing and grappling, joint-locking and arresting techniques, pressure point striking and manipulation, techniques based on the movements of certain "martial" animals (such as the tiger, crane, preying mantis, etc. ), falling techniques and martial arts gymnastics, body protection and internal development, traditional Korean forms, traditional Korean weapons, and much more. Containing 3608 techniques in 270 different categories, Kuk Sool Won ™ appeals to the beginner and the advanced practitioner alike, and has been described as a "graduate level" martial arts program. TRADITIONAL WEAPONS TRAINING: While many (though not all) karate styles contain weapons forms and techniques in their curriculum, Kuk Sool Won ™ is unique in the types of weapons we teach. Primarily because of the developmental background of karate, most of the weapons taught are derived from the farming implements and peasant tools of the Okinawan farmer: the bo (a long staff used for carrying and herding), nunchaku (derived from the rice flail used to separate the grain from the chaff), tonfa (originally the wooden handle for a grinding mill), the sai (a 3-pronged instrument used in farming and in assembling the yoke of an ox-cart), and so on. Because of the extremely comprehensive nature of Kuk Sool Won ™, weapons training is a valuable and integral part of the training of our students at Kuk Sool Won ™ Sudbury. Q. How long will it take me to get a Black Belt? How does all of that work? A. Of course the length of training time necessary to get a Black Belt in Kuk Sool Won ™ will vary slightly from person to person, the actual time it may take is surprisingly short when you consider what you will be learning to get there. While many styles tend to "teaspoon" their teaching and to drag out the material (and your training) as long as possible because there really isn't much to teach after black belt level, that isn't really even a consideration at Kuk Sool Won ™ Sudbury. With a martial arts system comprised of over 3600 techniques, "teaspooning" the material out is the least of our worries. In fact, even with over 225 different techniques on the syllabus from White Belt to Black Belt, there is almost as much material from Black Belt to 2nd Degree as there is from White to Black. Our instructors are always conscious of your progress, and try to keep you current on your testing cycle. If you come to class consistently, train seriously and practice for at least a few hours a week outside of class you can generally reach Black Belt at Kuk Sool Won ™ Sudbury in (on the average) 2 to 3 years. In this time, we can guarantee that you will learn more than in any other martial arts school in the area. Q. I already have a Belt in another martial art. Will I be able to keep my same rank when I start classes at Kuk Sool Won ™ Sudbury? A. Unfortunately, a Black Belt in another style will not really translate into the same rank in Kuk Sool Won ™ - in some systems, such as American Karate, they are able to do this because of the "loose" requirements for testing and promotion. In Kuk Sool Won ™, however, there is a standard curriculum with very specific requirements for each rank. Does this mean, then, that any prior training or rank that I may have had will be wasted? The BEST answer to that is "No," for several very good reasons. Training in any martial art has certain benefits, and you will always have these benefits; they are never wasted - the confidence, knowledge and skills you have learned (whether in martial arts or any other endeavor) will always be a part of you. Prior training will generally help you to progress faster in Kuk Sool than those students who have never had martial arts before. Many of the basics are translatable, even when the more "style specific" techniques are not. We recognize this at Kuk Sool Won ™ Sudbury and will generally allow a student with prior martial arts training to progress from belt-to-belt rather than being locked into our normal stripe testing system. If you think that you might qualify for this, we invite you to speak with the School Master about this possibility. Kuk Sool Won ™ is often described as a "graduate level" martial arts program with a training curriculum that goes far beyond what is available in most other styles, and because of this we very often attract students who already have training in some other style. Regardless of what other style you may have studied, it will often provide a good foundation for you to begin your training with us. Q. My wife wants me to take Kuk Sool Won ™ with my son, but I already have a Brown Belt in Tae Kwon Do. Won't this just be more of the same thing? A. As was pointed out in the previous question, Kuk Sool Won ™ will certainly not be just "more of the same." In fact, we have had a number of students who have had previous training in Tae Kwon Do, and the differences are obvious immediately: our techniques are similar to the techniques practiced in some Tae Kwon Do schools (when they are offered at all) at about the Brown or Black Belt level, and even our White Belt form (Ki Cho Hyung) compares to some of the Black Belt forms in TKD. If you have had prior training in Tae Kwon Do you will be surprised and impressed by the difference our training offers. Q. I've looked into some other schools - would it be possible to take two different styles of martial arts at the same time? A. This is a question that a lot of people have before seeing the complexity of Kuk Sool Won ™. You could, of course, train in two different styles if you wish - but why would you want to? People taking more limited styles of martial arts (such as karate) may feel it necessary to take other martial arts to cover "all the bases" - perhaps Judo for throwing and grappling, Aikido for joint-locking, Jiu-jitsu for pressure points, kung fu for weapons, etc. - at an additional investment of time and money. Fortunately, Kuk Sool Won ™ already has those "bases" covered for you because we are not a "style" of martial arts at all, but are instead a very comprehensive martial arts "system" which contains elements of over 30 different styles of martial arts. So, while there are certainly no restrictions against training in some other style at the same time you study Kuk Sool, there really is no reason for you to have to. Q. When do your classes begin? Do I need to wait until the beginning of the season to start? A. Unlike some activities like football or cricket, you can begin classes at Kuk Sool Won ™ Sudbury anytime. There really isn't a martial arts "season," and it is an activity that can be practiced year-round. Q. How often do I need to come to class? I'm not sure if I have enough time to do well and progress in martial arts. A. A lot of people overestimate the amount of time necessary to progress in martial arts. At Kuk Sool Won ™ Sudbury, if you are able to attend at least 2 classes per week (and spend just a couple hours a week training at home) you should be able to progress regularly. In fact, our lesson plans at Kuk Sool Won ™ Sudbury are set up with this schedule in mind. We understand that you have other activities going on with work, school and family. That's why we offer several different class times during the day and evenings so you can pick what is most convenient to you. Q. I notice in your classes that there is a lot of tumbling. Do I need to be able to do gymnastics to take Kuk Sool Won ™? Can I still advance even if I can't do acrobatics? A. Absolutely! You can progress - and even earn a Black Belt - in Kuk Sool Won ™ at whatever level you may be at. You will never be required to do something beyond your personal ability just because another student may be able to. At Kuk Sool Won ™ Sudbury the only person that you are ever judged against is yourself. All we ask from you is a commitment to do your best, and to try to grow a little more in your abilities every day. Remember that our training curriculum at Kuk Sool Won ™ Sudbury is based on the individual - not the group. Therefore, when you see some students doing advanced gymnastics and spectacular falls or kicks it is because they can. Everyone will have certain strengths and weakness that they bring to class, and our goal is to build on your personal strengths while at the same time helping you to overcome any weak areas that you might have. Talk to some of our students and ask about accomplishments they have made - they may all be different, but they are all important. We promise you that if you will just make the commitment to try, one day you will look back and be surprised at just how far you have come. Q. I have heard some of the students talk about martial arts "forms" - what exactly are forms, and do I really need to do them? A. A "form" (called a "hyung" in Korean) is a prearranged series of movements performed in a dance-like manner, and is probably the most important training tool that you will have in the martial arts. A traditional form is designed to not only allow you to practice patterns and techniques, or to train your body and build muscles and stamina - it is also extremely important in helping your body to learn the "vocabulary" of a particular martial art. Every style or system of martial arts is different, and each has it's own particular "flavour" as different from one style to the next as apples are from oranges (look at a Tae Kwon Do student and a Kuk Sool Won ™ student, and you will see very obvious differences in the way that they move). Practicing forms helps you to internalize the particular "flavour" of your style of martial arts through consistent practice, which will help you in every other aspect of your training. In Kuk Sool Won ™ forms are an integral part of your training, with an empty-hand form (and, often, one or more weapons forms) required for each rank. Q. Do you spar in Kuk Sool Won ™? I am interested in competition, and don't want to just learn forms and techniques. A. At Kuk Sool Won ™ Sudbury we practice several different types of sparring (beginning at Yellow Belt level for adults, Blue Belt for children) and, while sparring is not required, it is an option available to you if your are interested in it. If you do choose to spar, we begin with sparring drills, and then advance to very light Kuk Sool Won ™-style tournament sparring (no-contact), open-style tournament sparring (light-contact), Korean rules sparring (continuous 3-minute rounds with moderate contact). We also teach grapple sparring (more of a self-defense training which teaches you to apply techniques in a fluid and changing manner), yudo sparring (consisting of sweeps and body throws) and martial arts sparring (a controlled freestyle sparring which allows striking, kicking, throwing, sweeps and grappling - this is restricted to Brown Belt level and above). Competition is not a required (or even an overly important) aspect of Kuk Sool Won ™, although we do participate in tournaments on a limited basis. It is important to realize that traditional martial arts training is not a sport and, while some competition can be pursued on a limited basis, we do not limit our training to what will help you to score points in a tournament setting. Q. Do you have tournaments? What are they like? Is participation required? A. This goes back to the "sparring" question above. Kuk Sool Won ™ is not a tournament style (unlike most styles of "American karate" which train almost exclusively for competition), although there is some tournament participation available to students who are interested. We do try to attend any area or regional Kuk Sool Won ™ tournaments, if possible. These tournaments are geared specifically to allow students to complete in all areas of training - not just forms and sparring. In a Kuk Sool Won ™ tournament students may compete in empty hand forms, weapons forms, sparring (with strict no-contact rules), techniques (appropriate to belt level), self-defense and breaking. After Black Belt level, additional categories of competition (such as demonstration techniques, knife-throwing and archery) are also often available. Again, tournament participation is NOT a requirement at Kuk Sool Won ™ Sudbury but we do offer this type of training for those students who might be interested. Q. I am trying to decide whether to sign my children - ages 8 and 10 - up for football or for Kuk Sool Won ™. We don't have time for both. How can I decide which will be better for them? A. Any type of activity can potentially be beneficial for children, but a traditional martial arts system teaches not only physical skills and competitiveness (which, if not taught properly, can easily lead to aggressive behavior), but also positive values such as respect, self-confidence, self-discipline, goal-setting, etc. A good martial arts school, like Kuk Sool Won ™ Sudbury offers young children a supportive environment with positive role models to help them develop into confident, polite and respectful citizens. Remember, it has been said that "values can't be taught, the can only be caught" - at Kuk Sool Won ™ Sudbury we feel that it is our job to give our young students the opportunity to "catch" as many good values as possible. Q. When is a good age to start? Also, I would like to have a family activity, but since I am older and my child is 6, will I be held back to her level if we take at the same time? A. At Kuk Sool Won ™ Sudbury we generally start children at about 6 years old (based on attention span and other factors), although we do start them at a younger age if a parent or older sibling trains with us, as well. This is because younger children are still able to learn and progress if they are able to get help at home. To allow both parent and child to progress, however, classes are split into age- and rank-specific groups which allows both adults and children to progress at their own pace. The great thing about families training together is that, very often, the kids are able to help the parents to learn forms or techniques - we have found that this is a tremendous confidence builder for your kids! Q. I'm in my 40's and NOT very athletic. Also, I have an old injury that bothers me from time to time. I am worried that Kuk Sool Won ™ training might be too much for me. A. Because all of our training here at Kuk Sool Won ™ Sudbury is self-paced and personal, age or reasonable physical limitations are never a problem and we are able to structure your training around any old injuries or restrictions that you might have. We have many adult students, and a good number of them started training in their 40's (some even started in their 50's or 60's!). The traditional martial arts training program at Kuk Sool Won ™ Sudbury follows the philosophy that your health should be your primary consideration in training, while self-defense is just a useful by-product. Remember (as you will often hear our chief instructor say), you may not ever be in a fight, but you have to get out of bed every day of your life. Q. I have to be out of town a lot and may be unable to attend all of the classes. Will this hold me back? Will I be charged for classes I don't attend? Q. I would like for my son to take Kuk Sool Won ™ but he's got a bad temper. I'm just worried that he might use this to hurt other kids. Should someone like him take martial arts? A. One of the great benefits of training at Kuk Sool Won ™ Sudbury is that the main lesson that we want to impart to our kids is "martial arts etiquette" - simply respect and good manners. We emphasize to our kids that the techniques they learn in class are for self-defense ONLY and should never be used against their friends or siblings. Many times an aggressive nature is little more than too much physical energy with no appropriate outlet to channel it away - martial arts training is a great outlet for kids and the perfect activity to channel their aggression into a more positive area. Q. My daughter is little and shy. I would like to get her into something to build her self-confidence and physical condition. Is Kuk Sool Won ™ right for her? Will she get hurt? A. This is the other side of the coin to the question above. While some kids might be loud and aggressive, many other children are quiet and shy. Martial arts training helps to inspire confidence in children in a way no other organized activity is able to do. Unlike most organized sporting activities like football or rugby, the martial arts really doesn't have "stars" and "benchwarmers" (and what destroys a child's confidence more than being involved in a sport where they are always sitting out on the bench because of a coach who cares more about "winning the game" than developing the children on the team?). In a martial arts class everybody participates, and there are so many different elements in traditional martial arts training that all of the kids can be "one of the best" at something. In addition, at Kuk Sool Won ™ Sudbury part of the training is allowing the kids to come up in front of the group (when we feel they are comfortable with it) and leading the rest of the kids in part of the class (such as exercises, punches and kicks, etc.). This is not only a GREAT confidence-builder in itself, it also helps to teach the child associated skills such as leadership, speaking in front of a group, and so on that will help them throughout the rest of their lives. Punching and kicking are great, but at Kuk Sool Won ™ Sudbury we believe that the MOST valuable lessons we can give to a child are the intangibles that will help them to be more confident, out-going and successful citizens. Q. Is everything included in my monthly tuition? I have a friend that takes karate, and he had to buy a lot of expensive sparring equipment for class, THEN he had to go to a lot of tournaments to get promoted to his next belt! A. Everything you will need for our regular program is included in your monthly tuition. Should you choose to participate in a regular basis in sparring class, tournaments, etc. there will, of course, be some additional fees for equipment purchase and tournament or workshop registration. We will do our best, however, to keep any additional fees as nominal as possible and always try to give you your best value for your money. In addition to your tuition, there are also testing fees for belt testing that are quite reasonable and which occur only every 2-3 months. You will never be "surprised" by a fee, and we will notify you about any possible fees well in advance. Q. Are there other Kuk Sool Won ™ schools around? I used to take at another karate school and when I moved here no one had ever heard of it. I think the guy just made it up! I really feel like he took advantage of me. A. Unfortunately, this is much more common that we would like to admit. In the martial arts there really isn't any kind of governing body so, basically, anyone can declare himself a "master" and start teaching. In most cases in the martial arts, it really is just a case of "Buyer Beware." Kuk Sool Won ™ Sudbury is very different in that respect. Not only are we a registered member of the World Kuk Sool Association (the largest organization of its type in the world), but we are also required to adhere to a very specific syllabus in our teaching. That way, if you move to another area and find a Kuk Sool Won ™ school there, not only would you be able to maintain your current rank, you would also know exactly the same material as every other student at your level in your new school. When you enroll at Kuk Sool Won ™ Sudbury you are also issued a membership number with the World Kuk Sool Association that will never expire - you will never have to "join" the Association again if you move to another school, and your rank is kept on file, as well, so that even if you stop taking classes for a while you will be able to keep your previous rank when you return (of course, you will have to review and remember all of your old material before being able to advance). We have had students in our own school who stopped training as long as 7 years ago, only to come back as an adult and basically begin where they left off! Q. That sounds pretty good, but how do I know that I won't be taking classes from someone somewhere who just "says" they teach Kuk Sool Won ™ when they are really just making it up or getting it from a book? A. Kuk Sool Won ™ is a registered trademark. Because of this no one can "just say" that they teach Kuk Sool Won ™ - every Kuk Sool Won ™ school must be registered and certified by the World Kuk Sool Association, the curriculum must follow the Association guidelines, the instructor/schoolowner must be personally certified by the Founder and Grandmaster of our system and all black belts issued are awarded by the Grandmaster personally! How about that for quality control? Q. I'm always hearing about "ancient" martial arts techniques. How old is Kuk Sool Won ™? A. The techniques in Kuk Sool Won ™ are, indeed, "ancient" - drawn from hundreds of years of Korean martial arts history (researched and compiled personally by our founder, Grandmaster Suh In Hyuk). The art of "Kuk Sool" ("National Martial Art") was first developed in the late 1950's in Korea, but the actual system of "Kuk Sool Won ™", was founded in the early 1960's. Putting together a complex and comprehensive system of forms and techniques based on historical Korean martial arts and containing techniques from all of the indigenous martial arts of Korea, it was Grandmaster Suh's intent to "return" their martial arts history to the Korean people by bringing together techniques that had been practiced in secret for many years (and in some cases almost lost forever). Because of this, even though the style itself is relatively new, Kuk Sool Won ™ is often described as a "living history of the Korean martial arts" and represents the most comprehensive system of traditional Korean martial arts in the world today. Q. But I thought that Tae Kwon Do was the traditional Korean martial art? A. Actually Tae Kwon Do is considered the Korean national sport. Widely practiced in Korea, and even part of the public school curriculum, Tae Kwon Do in Korea is about like baseball in the United States. Q. I once took Tae Kwon Do for a while, and I noticed right away that all of your forms look really different! But, if Tae Kwon Do and Kuk Sool Won ™ are both Korean, why do they look so different? A. That is a great question, and it is mostly based on an extremely persistent misunderstanding. In point of fact, Tae Kwon Do is not really a traditional Korean martial art at all but is, in fact, more similar to Japanese karate. The reason for this is that after the Japanese "annexation" of Korea in the early 1900's the practice of most Korean arts (including martial arts) was forbidden by the occupiers, while the practice of Japanese martial arts was encouraged. Because of this there resulted an entire generation of Koreans trained in Japanese martial arts. At the end of World War II when the Japanese were thrown out of the country, many Korean martial arts masters got together to form "kwans" (or "schools") and, in the spirit of nationalism, "glossed over" the fact that the styles were really Japanese - basically, forms and patterns based on the Japanese Heian kata with some Korean kicking thrown in for "spice." A prominent Tae Kwon Do master (who is also a history professor at Rice University in Texas) researched the origins of Tae Kwon Do for years, and in the late 1980's reported that (even though he had desperately hoped to uncover a traditional Korean origin), in his learned opinion, "the founder of Tae Kwon Do was really Ginchin Funakoshi" - the founder of Japanese Shotokan Karate. This is why Tae Kwon Do forms and movements are so hard and linear (as opposed to the circular, soft and flowing movements of Kuk Sool Won ™) and why they so closely resemble Japanese martial arts. Q. Is Kuk Sool Won ™ safe? I am a professional and I can't really afford to show up in the office with a black eye or a broken nose! A. 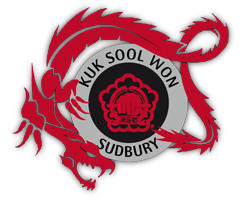 Unlike a lot of more competitive martial arts schools, training at Kuk Sool Won ™ Sudbury is extremely safe. While there may be the occasional pulled muscle from overexertion, the actual contact is extremely minimal and well-controlled. Students are taught to apply their techniques slowly and smoothly, always aware of the safety of their partner, and sparring (if you choose to participate in the sparring, which is not required for advancement) is closely supervised with no- to light-contact. Q. I noticed that during your classes, people spend a lot of time "yelling." What is that all about? First, the kihap is not so much the noise you make as what you do with your air. When you kihap, half of your air goes out and half is pushed down into your belly. Proper use of a kihap will give you more power by forcing the air down into the diaphragm and converting your body into a more-efficient weight-bearing mass. This is important not only in generating power for strikes, but also in helping to protect your body when taking a fall. The second important reason we kihap is to startle an attacker or an opponent. A kihap delivered unexpectedly in a loud, sharp burst can have the effect of temporarily disorienting an attacker to give you a split second "window" to counter or deliver an attack of your own. Q. I am a woman and I am interested in learning self-defense. What will I learn, and how soon will I learn it? A. Almost any type of traditional martial arts training will give some degree of self-defense benefit, but because of the "hard-soft" nature of Kuk Sool Won ™, the emphasis on attacking the sensitive joints and pressure points of an attacker and the idea of not trying to meet force-with-force (after all, most attackers will be bigger and stronger than you), Kuk Sool Won ™ is an excellent system for self defense. You will begin learning defensive techniques right away (remember, Kuk Sool is a martial art, not a sport), and many of them will be immediately applicable. As you progress in Kuk Sool Won ™, learning more and more techniques and developing a more comprehensive "toolbox" of techniques, the self-defense skills that you develop will become progressively more effective. In addition, Kuk Sool Won ™ Sudbury offers regular Workshops that are dedicated completely to self-defense and teach Kuk Sool techniques and concepts in a contemporary way. These classes also get into defense against weapons and multiple attackers much sooner than in our regular program. With the vast array of techniques in Kuk Sool Won ™ and our emphasis on having our students understand the principles behind them, Kuk Sool Won ™ is one of the very best systems around for learning self defense. Q. I am interested in weapons training. Does Kuk Sool Won ™ offer weapons training? A. Absolutely. In fact, Kuk Sool Won ™ especially after the Black Belt level is extremely weapons intensive and covers the full spectrum of traditional martial arts weaponry: bladed weapons, impact weapons, flexible weapons and throwing or projectile weapons. At the under-black belt level the student first learns weapons etiquette - the proper way to handle and use weapons, followed by basic weapons handling, techniques and forms and the finally, in some instances, 2-person weapons sets (a pre-arranged form with choreographed patterns of attack and defense). The weapons available at the underbelt level include the jool bong (a flail-like weapon commonly referred to as "nunchucks"), long staff (spinning motions, only) sword meditation and single short stick. One of the things that Kuk Sool Won ™ practitioners are noted for is their extensive repertoire of weapons forms and techniques. Q. With all of the schools and styles of karate available, why should I decide to take Kuk Sool Won ™? A. Okay, we may be a little biased here, but the short answer is that Kuk Sool Won ™ Sudbury offers you the very BEST value around for your martial arts dollar - great instructors, spacious and modern training facilities, a superior martial arts system and the camaraderie and support of fellow students. Q. I still have more questions that weren't answered on this web site. Is there someone I can talk to? A. Absolutely! We would be more than happy to speak with you about what Kuk Sool has to offer and answer all your questions and concerns. Send an email to karen@kuksool.co.uk.